An easy family recipe that's full of goodness. Cook the rice with the stock cube in a pan of boiling water for 15-20 minutes until tender (or cook the rice according to the instructions on the pack), then drain. Meanwhile, spread each of the salmon fillets with 1 tsp of Whole Grain mustard. 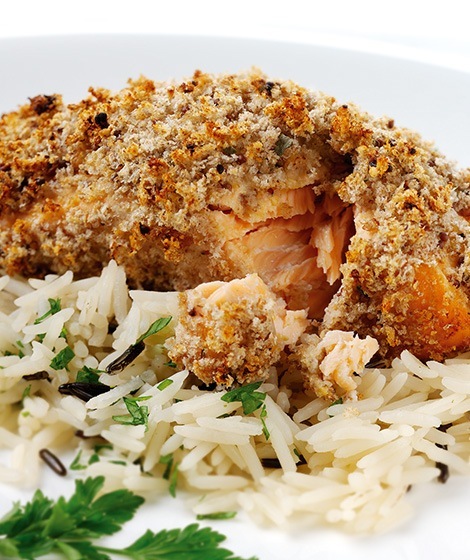 Mix together the wholemeal breadcrumbs, mixed herbs and seasoning, then press onto the salmon. Place on a small baking tray, lined with baking parchment and bake for 15 minutes. Stir the parsley into the rice and serve topped with salmon. Simply serve warm with a cup of tea or with warm fruit compote for a dessert.